To meet the diversified requirements of our prestigious clients, we are engaged in manufacturing and supplying a variety of Soft Loop Handle Bags, used in shops, malls, general stores etc. Keeping in mind the international standards of quality, the entire range is checked thoroughly on various quality parameters. Furthermore, we provide these bags with different specifications to meet the diversified requirements of our clients. Besides, clients can avail these bags from us at market-leading prices. Leveraging on our experience, we provide a wide range of Handle Bags used for packing various products in a safe condition. In order to cater various needs of our clients, we provide these bags in both standard and customized forms. Manufactured using quality proven raw materials and sophisticated technology in sync with industry norms, these bags are available in various sizes, shapes and colors. Further, this range is available in the market at nominal prices. Our firm specializes in providing our prestigious clients with a quality array of Soft Loop Handle Bags. These bags are manufactured using excellent quality raw materials and cutting edge technology by our skilled professionals. In addition to this, our offered bags are tested on various quality parameters to ensure their optimum quality. 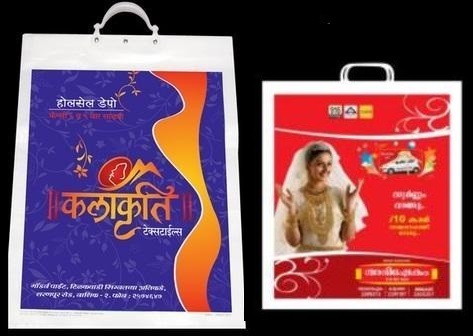 Provided bags are an effective packaging solution for shops, malls, general merchant store etc. Our clients can avail these bags in various sizes, shapes and colors at market-leading prices. Being a client-centric organization, we are engaged in offering a wide range of Color Plastic Handle Bags extensively used in various industries for packaging different type of goods. Our offered range is manufactured using quality tested raw materials and ultra modern technology in compliance with industry norms. Additionally, these bags are customized with logo and information given by the clients. Besides, these bags are available in various specifications according to the needs and requirements of the clients.